Oh, the video is them actually playing? Heck if I'm watching that! I didn't think I'd need to be on media blackout for this game, but I absolutely am not going to watch someone else play when the thing comes out in a few days and I will be counting down the seconds until launch. I just did (though I skipped a lot of the middle) and it taught me the mechanics of this game. I'm glad I reviewed it. 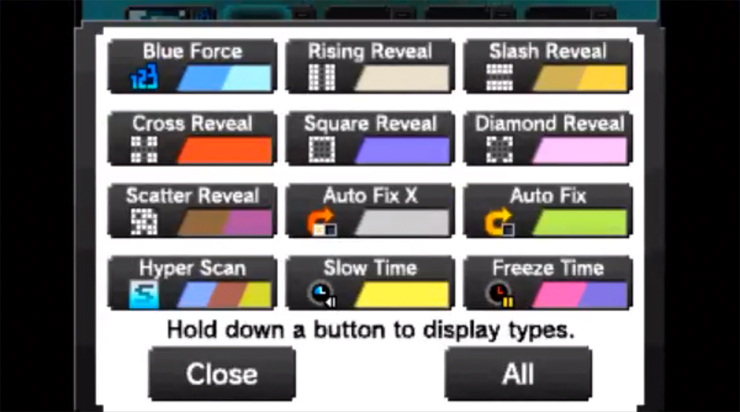 For anyone interested; So a lot of the intro video is tutorial levels. Boring as snot. You're given picrites for completing the levels and so far you'll earn 30 picrites per level. After five or so tutorials you get your first Pokemon in your collection and you'll do your first puzzle. It appears that Pokemon of each type have specific powers to help you solve puzzles. You can choose to use these or not. If you do use them, they have a limited usage unless you swap out Pokemon (probably costs picrites) or you can wait out the hour it takes for your Pokemon to recharge. Of course Nintendo hopes you'll need or want to pay. Luckily for me, I don't see myself needing to use the power ups at all. 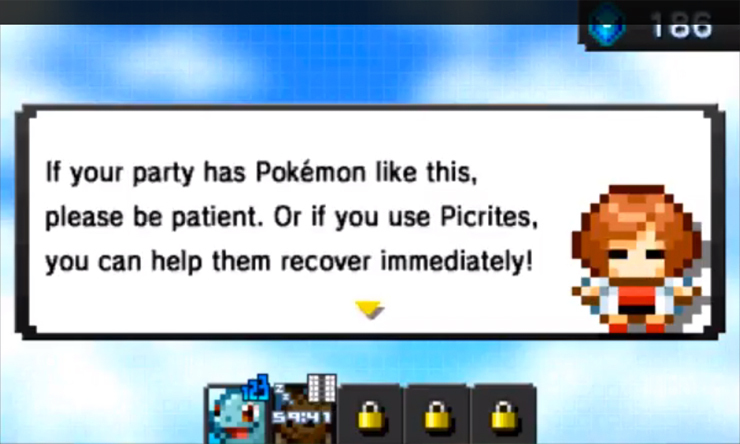 So as far as I can tell… this is a Free to Play Picross title with Pokemon puzzles. This excites the hell out of me. Each puzzle has criteria which help you earn even more picrites. I don't know if you can know this ahead of time but so far it's apparent that having certain types in your party and beating the stage under a certain time both will earn you picrites. Easy enough. I'm pretty stoked for this. So glad it's coming out Thursday. While I will try to play some Xenoblade Chronicles X come Friday, when I'm not at home, Pokemon Picross seems like it'll be a staple in my gaming diet. Nice. Here's a description of the types and their powers. The different stage goals on the first Pokemon stage. 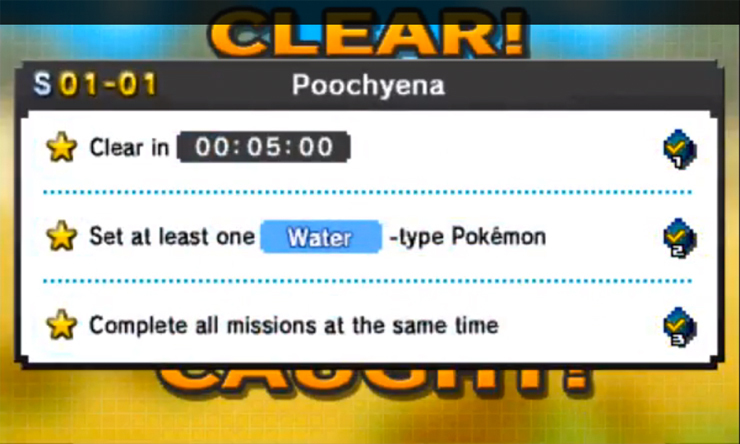 And here's a description of the picrites earned in the above screen. Finally, this is a screen showing the hour-long countdown counter for Squirtle and explanation of purchasing. December 3rd at 12AM, right? So I only have to wait ONE more full day, right? RIGHT?? Hey Nintendo, why you no let me pre-download this one! I'll be playing it as soon as I can Thursday so I'll mark it as played now (since tomorrow is a travel day and I won't be near a computer till Thursday anyway). So geeked to play. - Mega Evolution stages cost Picrites to access. EDIT: I've also heard (from a NeoGAF post) that the "game will not say if you are wrong." Which sounds like it plays like prior games' Normal Mode or whatever...? Not really my favorite way to play Picross, to be honest, but I can deal I guess. Apparently Oddish's ability auto-corrects a wrong placement though. Why isn't it on there yet!?!? 12pm est? Easy there, Mr. Fidget! It should be up with the rest of Thursday's eShop update. GIVE ME MY FRIGGEN PICROSS, NINTENDO! WHY YOU DO THIS TO US. I'm away from work, about to spend the day at a hospital, I need this for sanity reasons! (And I never have tried to buy something this early on release day). I was considering e4 but I'll give this a whirl for a while and see how it goes with the f2p model. Lol, this game is hilarious. I'll accept Pokemon ability help on this game when Tepigs can learn HM02. EDIT: Oh, that said, I am having a ton of fun with this so far. Picross at its best! Haha, did she say that?? I was kinda tapping through the beginning very quickly. So far, so good with Picross. Curious about what happens when I run out of gems, but I don't mind buying a few since the game is quite fun so far. 1. You get Picrites along the way as rewards. Heh, HM02. I get it! No. I Photoshopped that for accuracy. So here's the next question: What purchase method says to Nintendo "I like Picross, so I am giving you X amount of money because I want more Picross" and not "Hey this Free-to-Play garbage totally works to make you money so do more of it?" Because I'd like to buy the game so we get more delicious, delicious Picross, but I do not want to encourage FtP. Ugh. You're doing T-Bun's thing! Free to Play is fine! *Pay* to Play (microtransactions) is not. But I don't enjoy these timers on things. That's a Free-to-Play aspect, yes? That I have to wait two hours to continue? I want to give someone money, then play a game. I do not want to not give someone money and then wait X amount of time to play a game. To me time is way more valuable than money. I want to play a game and then be done, not constantly wonder if my Energy Bar has replenished yet so I can continue. If I had to sit around waiting to play the next level of Yoshi's Woolly World, for example, I would not have gone ahead and used the Keep It option at Gamefly, making it mine for good. Don't know when the optimum moment to upgrade the energy bar would be, or even if there is one without spending cash, but I'll keep an eye out. Heheh, semantic arguments! I think the phrase "free to play" generally implies a "paid microtransaction" element to it...at least in today's modern usage. Otherwise, you'd just call the game "free!" Oh well, no big deal either way. From what I can tell, BUYING (i.e. 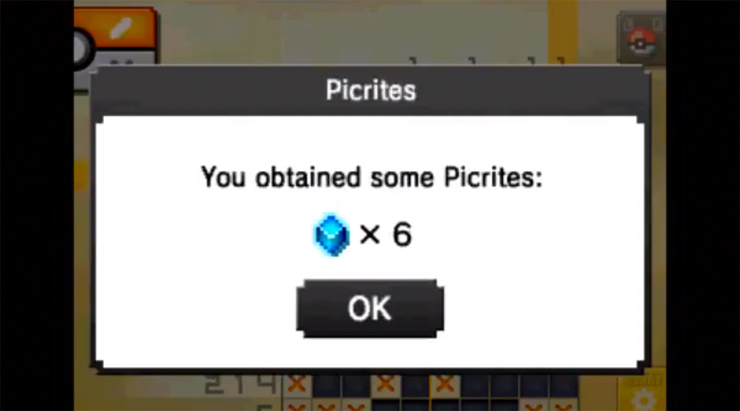 not winning, etc) a total of 5000 picrites gives you essentially an unlimited source of picrites, getting rid of the microtransaction stuff forever. You can use these picrites to reach level 5 on your energy bar, also giving you infinite energy. You can get 4000 picrites for 25 bucks, then the last 1000 through the two one-time deals for 5 more dollars, making a quick and easy 30 dollars to max out the game right now and play it like a normal person would. Unfortunately, there's not really a different way of spending that money, so it might still send the "this pricing method is fine, Nintendo!" message to the Big N.
Working is for suckers, there's Picross to be playing. Time flies by and you don't even realize you're starving to death or anything. Just quit the job and spend the last of your funds on infinite picrites. Done and done.